This year saw impressive debut films, experimental cinema that broke the rules, and quite a few films with women in the lead. And then, of course, there were films that tried out new things but didn't quite pull it off. It has also been a year when the audience embraced good storylines and performances, proving yet again that the mere presence of a star cannot rescue a lazy film at the box-office. TNM brings you the best and most interesting films of 2018 in no particular order. Kaala: Pa Ranjith's second film with Rajinikanth saw a more assured director overturning conventional ideas about black and white, good and evil, Ram and Ravanan, men and women. The film, set in Mumbai's Dharavi, saw Rajinikanth playing a local don who fights for the rights of the Tamil people. In doing so, Ranjith also questioned the caste hegemony built into social structures, particularly when it comes to ownership of land. He also gave us powerful women characters played by Easwari Rao, Anjali Patil, and Huma Qureshi. This bold film took on Hindutva politics, directly landing punches at the saffronisation of the country and the attempts to realign it according to the casteist laws of Manu. Kaala is one of the most layered Tamil films we've seen till date, lending itself to numerous readings, and Ranjith pulls this off within the large and very mainstream canvas that is a Rajinikanth film. Merku Thodarchi Malai: Directed by Lenin Bharathi, this film about tea estate workers in the Western Ghats, had Antony and Gayathri Krishna in lead roles. The film is about how the workers are exploited in the tea estate and how they begin to challenge their labour conditions with the arrival of communism. With gentle humour running throughout the narrative, this film, which depicted ordinary lives and realistic circumstances was a relief from the big budget star vehicles that hit the screens way too often. 96: Although almost every Tamil film which comes out has a romance track, seldom have they struck a chord with the audience to the extent that Prem Kumar's debut film did. Starring Vijay Sethupathi and Trisha as school sweethearts who meet after decades at a reunion, 96 took us all on a nostalgia trip. The young people who played the lead actors in their school days - Gouri G Kishan and Adithya Bhaskar - also deserve praise for their performances. The hauntingly beautiful music by Govind Vasantha is another reason why so many fell in love with the film. Ratsasan: Ramkumar's film about a serial killer is easily among the most gripping thrillers that Tamil cinema has made. With Vishnu Vishal and Amala Paul in the lead, the film is about a man who abducts and murders teenaged schoolgirls. The film had a well-structured plot with enough twists and turns, including a convincing red herring, to keep the audience engaged till the end. The only sore point was making the serial killer, a person with the congenital condition of progeria, into the convenient "freak". Ghibran's background score was also a big plus for the film. Pariyerum Perumal: Mari Selvaraj's debut directorial had Kathir and Anandhi in the lead. The film, set in a law college in Tamil Nadu, was about the omnipresence of caste and how Pariyan, a Dalit youth, fights against the systemic oppression he sees around him. Using the metaphor of a dog, Karuppi, to tell the story was especially hard-hitting. Although the film had only a limited release initially, more screens were added after public demand. While the film was applauded by many, it was also criticised by some for depicting the humiliation of Dalits explicitly without portraying an adequate fight back, thereby making it more palatable for casteist oppressors. Kolamaavu Kokila: Directed by Nelson Dilipkumar, this film was all about Nayanthara and the 'Lady Superstar' lived up to her moniker. In this absurd comedy, Nayanthara plays a young woman who traffics drugs because of family circumstances. Though such storylines about a woman doing difficult work for the sake of her family have been around for ages, they've always been tragedies and usually full of melodrama. Kolamaavu Kokila, on the other hand, had plenty of humour. The body shaming comedy involving Yogi Babu, however, could have been avoided. 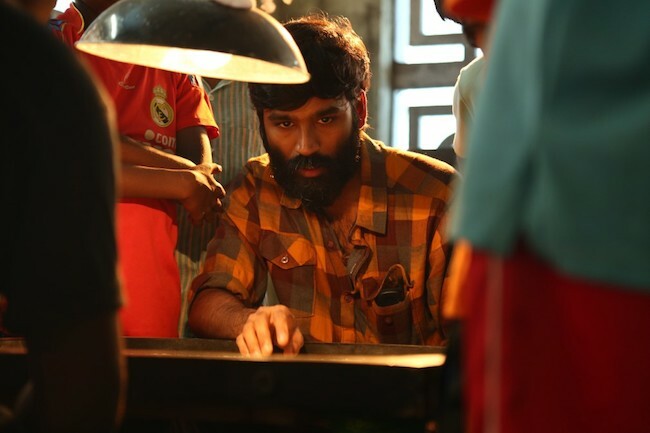 Vada Chennai: The first part from Vetrimaaran's trilogy about gangsters in North Madras released this year. With Dhanush and Aishwarya Rajesh in the lead, the film had a large star cast, including Andrea and Samuthirakani playing pivotal roles. The story moves back and forth in time, tracing the origins of the gangs prevalent in the area, their rise and fall, and how Anbu, played by Dhanush, comes to control the group. Like Kaala, Vada Chennai also talks about land ownership. Rated 'A', the film had plenty of violence and abusive language, which some felt stereotyped the people of the area. Nadigaiyar Thilagam: Directed by Nag Ashwin, this biopic of veteran actor Savitri was released in Telugu as Mahanati. The film had Keerthy Suresh in the lead, a choice which initially surprised people, given that the actor usually played lightweight roles in her films. However, as Savitri, Keerthy was immensely convincing. The film also had a host of others in the cast, including Samantha, Vijay Deverakonda, and Dulquer Salmaan. The subject of a woman actor who goes through a lot of strife in her marital life and eventually dies because of her alcoholism was handled with empathy, and went on to become a massive success at the box-office. U Turn: The Tamil remake of the Kannada film by the same title also had a simultaneous release in Telugu. Directed by Pawan Kumar, U Turn had Samantha playing an investigative journalist. The actor, who usually appears in mainstream films for a song and a dance, proved her calibre in the film. The supernatural thriller has a somewhat disappointing climax but deserves a place on this list nevertheless for its well-told story. Kaatrin Mozhi: The Tamil remake of Vidya Balan's Tumhari Sulu had Jyothika in the lead. Directed by Radha Mohan, the film is about a homemaker who aspires to find a job and ends up becoming an RJ anchoring a late-night show. The remake was near faithful to the original and Jyothika's performance, too, drew praise. Although the film had only a small window at the box-office, given that it released between Vijay's Sarkar and Rajinikanth's 2.0, it still managed to hold up, especially in the metros. Irumbuthirai: PS Mithran's thriller about data breach in the age of information technology, also took on the central government quite boldly. The film, with Vishal and Samantha in the lead, had a new story to offer within the mainstream format. Arjun Sarja, who was recently named in the #MeToo movement by Sruthi Hariharan, played the antagonist. The film also had a surprising role for the hero - an army man who isn't in the least patriotic! Kanaa: Director Arunraja Kamaraj's debut film about a young girl from rural Tamil Nadu who becomes an international cricketer saw Aishwarya Rajesh delivering a knock-out performance. Although the film followed the familiar trajectory of a sports drama, Aishwarya's terrific acting made sure that the audience stayed invested throughout. Seethakaathi: Balaji Tharaneetharan's second film is a tribute to theatre and a satirical take on mainstream Tamil cinema. Starring Vijay Sethupathi in the lead, the film has a unique premise - a dead stage actor's spirit infuses with wannabe film stars, turning them into superstars overnight. Although not everything about it works, the film must be given credit for daring to move away from the conventions of Tamil cinema and critiquing it too. Govind Vasantha's beautiful music was another big plus for the film. 2018 was also the year when Tamil cinema gave India its first space film - Jayam Ravi's Tik Tik Tik. However, though the film had good visual effects, the plot and screenplay were quite juvenile. Karthik Subbaraj brought out Mercury, a daring attempt at silent cinema. Starring Prabhudeva in the lead, the film was about a group of hearing and speech impaired friends who find themselves hunted by a man who is visually impaired. Although the premise was quite exciting, the film didn't quite pull off the thrills entirely. Shankar-Rajinikanth's 2.0 was a visually grand film, which brought back the dismantled Chitti to life. While the 3D technology in the film was unlike anything experienced in Tamil cinema, the film was disappointing because it lacked a detailed storyline and was too simplistic. Akshay Kumar as the villain didn't quite work in the Tamil film. This year had a parody film hit the screens - CS Amudhan's Tamizh Padam 2, which was an enjoyable watch for people who are familiar with mainstream Tamil films. For others, however, the film wasn't quite cogent enough because much of it was stringing together scenes from other films. The film did take on the 'loosu ponnu' stereotype and the done to death 'farmer sentiment' in Tamil films though. Speaking of farmers, Karthi's Kadai Kutty Singam, directed by Pandiraj, was among the rare Tamil films to have shown a prosperous and educated farmer. The film was about a farmer with a large family and though the story itself was nothing new, the depiction of the various relationships in the family with good humour, made it an entertaining watch. Elan's Pyaar Prema Kaadhal was a hit among young people, with Bigg Boss fame Harish Kalyan and Raiza playing the lead roles. Although the film had some fun sequences and seemingly broke conventions with a "bold" heroine, it didn't quite have the courage to push the envelope, and settled for bringing the heroine back to age-old ideas about morality. Mani Ratnam's Chekka Chivantha Vaanam was a multi-starrer which received mostly good reviews but much of the applause seemed to come from relief that the filmmaker had not lost his form entirely. The film had a weak storyline and the women characters had very limited screen-time, too. Anand Shankar's NOTA and AR Murugadoss's Sarkar, with Vijay Deverakonda and Vijay in the lead respectively, were films that landed punches on the Tamil Nadu state government. While the first was way more blatant in the references it made to real-life incidents in the state, it was the second film which drew the ire of the AIADMK. NOTA also had a meaty role for a woman politician played exceedingly well by Sanchana Natarajan. Both films, however, were formulaic - the idea of an overnight CM changing politics is quite old in Tamil cinema, after all.